Personalized water globes make lovely gifts for Christmas, birthdays, anniversaries and other special occasions. Personalizing them makes them special for the recipient because they know that you spent time selecting, then having the gift customized just for them. Each of the globes on this page can be personalized to order by filling in the fields on the product page when ordering. Just make sure to carefully consider how many characters you can put on each line for your message. Click the link to see pricing, availability and other options. 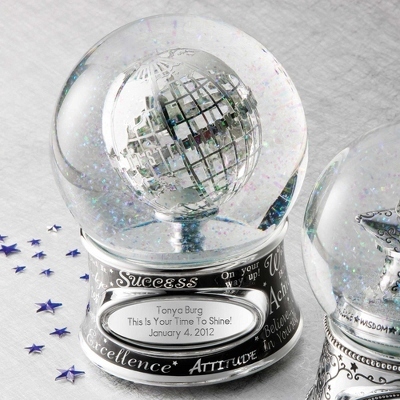 Musical globes will say which melody they play and you can watch a video for many of these water globes and snow globes. Personalized water globes make lovely gifts for Christmas, birthdays, anniversaries and other special occasions.